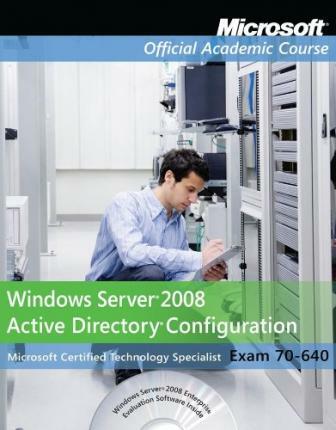 Exam 70-640, Windows Server 2008 Active Directory Configuration. The newest iteration of the Microsoft Official Academic Course (MOAC) program for network administration courses using Windows Server 2008 and mapping to the Microsoft Certified Technology Specialist (MCTS) 70-640 certification exam. The MOAC IT Professional series is the Official from Microsoft, turn-key Workforce training program that leads to professional certification and was authored for college instructors and college students. MOAC gets instructors ready to teach and students ready for work by delivering essential resources in 5 key areas: Instructor readiness, student software, student assessment, instruction resources, and learning validation. With the Microsoft Official Academic course program, you are getting instructional support from Microsoft; materials that are current, accurate, and technologically innovative to make course delivery easy. Call one of our MOAC Sales Consultants and request your sample materials today. Overview of Active Directory Domain Services. Implementing Active Directory. Working with Active Directory Sites. Global Catalog and Flexible Single Master Operations (FSMO) Roles. Active Directory Administration. Security Planning and Administrative Delegation. Introduction to Group Policy. Configuring the User and Computer Environment Using Group Policy. Performing Software Installation with Group Policy. Planning a Group Policy Management and Implementation Strategy. Active Directory Maintenance, Troubleshooting, and Disaster Recovery. Configuring Name Resolution and Additional Services. Configuring Active Directory Certificate Services.